If berries are frozen, thaw slightly but not until mushy. Mix gf flour and sugar together in large bowl and add berries. 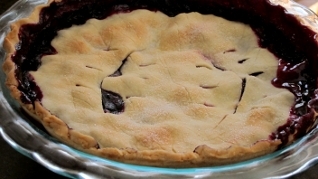 Place berries in shell, and cover with top crust. Crimp edges and cut small steam vents in top. Bake 30 minutes and if edges are getting brown, cover edges with aluminum foil and bake an additional 30 minutes or until blueberries bubble out on top.